I based her cake off of this recipe from Chocolate Covered Katie and her frosting off of this recipe from The Edible Perspective. I drizzled a little bit of melted chocolate over the cake for color. 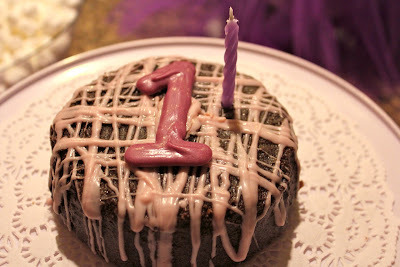 I also wrote a 1 on a piece wax paper with the chocolate, allowed it to cool, and placed it on frosted cake. Preheat oven to 350 degrees. Combine all ingredients and pour into a greased 16oz corning ware dish or small cake pan. Bake for 17-20 minutes. Allow to cool completely before frosting. Almond Milk to reach desired consistency. Combine all ingredients in a food processor or blender until smooth. Pour into a bowl and place in fridge. Once cake has cooled, frost cake. Hopefully your little 1 year old enjoys the cake!